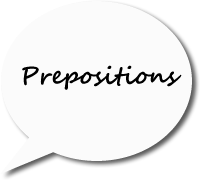 Grammar Lessons - Prepositions of Place. and other kinds of prepositions. The following table includes the English prepositions of place. The girl who is by / next to / beside the house. I hung my coat behind the door. Most of the carpets are over $100. She walked across the field/road. They walked slowly through the woods. I go to bed at ten. Shall we go into the garden? She stood up and walked towards him.